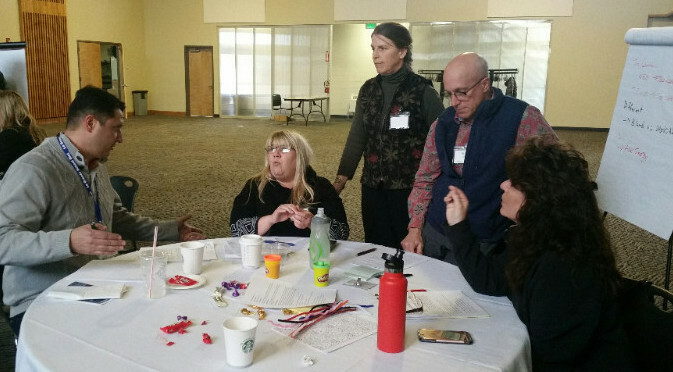 Rural Oregon's nonprofit organizations are exploring how diversity, equity, and inclusion (DEI) can build understanding, strengthen mission impact, and ensure public benefit. To this end, NEOEDD is organizing a series of roundtable discussions for regional nonprofit board members and staff to learn, share, and discuss DEI methods and strategies. The next roundtable will be held Feb. 7, 2018; others are planned for May 2, Aug. 1, and Nov. 7, 2018, and Feb. 6, 2019. Sessions in October and December of last year focused on DEI in general and how it can affect the leadership and programs of organizations. The Feb. 7 roundtable focuses on a specific area of DEI: how denying human rights to the lesbian, gay, bisexual, transsexual, or queer members of our community not only threatens those individuals in obvious ways, but is also detrimental to everyone in the community. "A community that is not safe for all of its members isn’t safe for any of its members," notes Bowen. "This roundtable will offer history and also present-day implications of fear and bigotry." The cost to attend is $25 per person per roundtable discussion. Scholarships are available; please inquire at NEOEDD, 541-426-3598. Registration link here. The sessions include lunch.The cost to attend is $25 per person per roundtable discussion. Scholarships are available; please inquire at NEOEDD, 541-426-3598. Registration here. Save Dates for CEDS--and Take the Values Survey! In today’s competitive global market, it is necessary for regions to have a long-term economic development strategy that can serve as a roadmap to progress and prosperity. The Comprehensive Economic Development Strategy (CEDS) does just that. It is a locally based, regionally driven economic-development planning process that successfully engages community leaders, private sector partners, Economic Development Districts (EDDs), and other stakeholders in planning for our region’s future. NEOEDD is leading a series of conversations and surveys across the region to gather input for a new CEDS document that will guide development activities for 2018-2023. 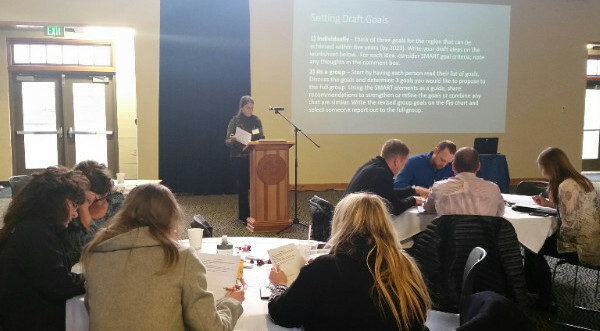 On Jan. 24 community and business leaders from across Northeast Oregon gathered in La Grande (photos below) to consider the results of a Strengths, Weaknesses, Opportunities and Threats (SWOT) survey that NEOEDD distributed in January. The next step in the CEDS process is a public survey and three public discussions. What are the guiding values that community leaders should consider when making policy? Take this survey to add your thoughts. RSVP or ask for more information at NEOEDD, 541-426-3598. 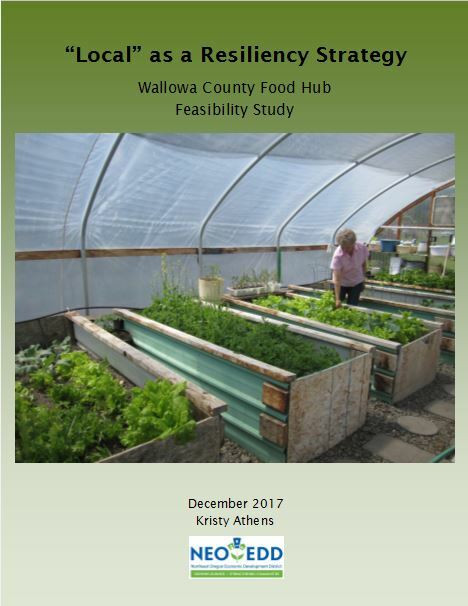 Kristy Athens has been busy working on a food hub feasibility study--check it out here! Welcome to new board member Bob Kavanaugh! Bob is the executive director of the Union County Chamber of Commerce and has lived in the area for five years. His love for the county and its people got him involved in public service. "I see all the great things that go on here," Bob says, "and I want to be involved in any way I can." 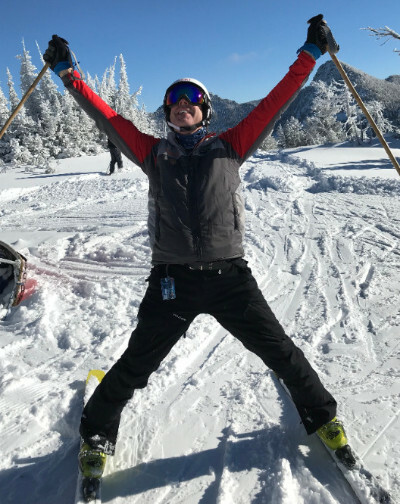 He enjoys taking advantage of the outdoors, particularly skiing, backpacking, and rafting. He is excited to serve on the board of NEOEDD. "What I like most about NEOEDD is how proactive they are at seeking business opportunities and growing our economy," he says. "NEOEDD is a trusted organization, and I like that." 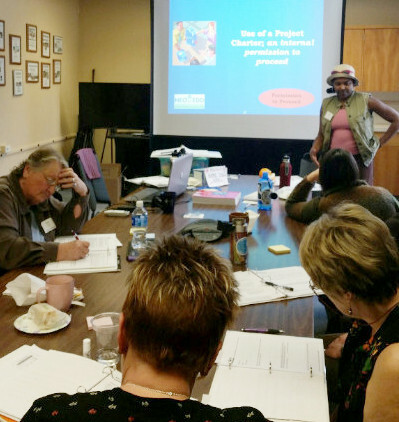 Local nonprofit representatives from Maxville Heritage Interpretive Center and Enterprise Cemetery District learn about the grantwriting process at NEOEDD's GrantReady training in Enterprise. 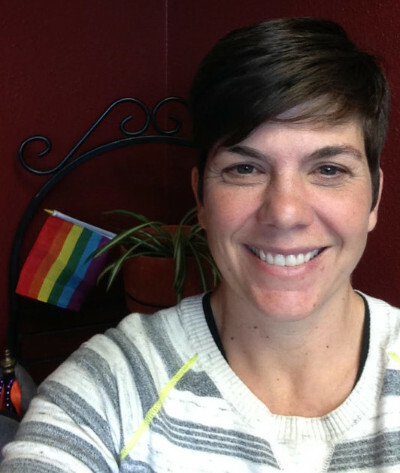 This workshop series will be offered in Baker City Saturdays, Apr. 7-28; click here to register. The 2017 USDA Census of Agriculture is available for producers of food until Feb. 5. Click here for more information. The Union County Chamber of Commerce is accepting nominations until Feb. 5 for the 2018 Chamber of Commerce Awards Banquet, Mar. 23 at the Blue Mountain Conference Center in La Grande. Call the Chamber office at 541-963-8588 for more information. BMCC SBDC offers the 4-part "Accounting Principles" workshop Feb. 6, 13, 20, 27 at 3 p.m. in Baker City. Cost $59. Click here for more information. Transition United States offers "How to Get Media Attention for Your Community Project" webinar Feb. 8 at noon. Click here for more information. BMCC SBDC offers "Quickbooks: Payroll" workshop Feb. 13, 20 at 6 p.m. in Enterprise. Cost $59. Click here for more information. Baker County Business Round Table and Baker County Employer Council meet the second Tuesday of the month (Feb. 13) at 8 a.m. at The Little Bagel Shop. Call the Chamber of Commerce office at 541-523-5855 for more information. Fishtrap hosts a conference addressing challenges in agriculture titled "The New Agrarians" Feb. 16-18 in Enterprise. Click here for more information. The OR Wine Symposium is Feb. 20-21 in Portland. Click here for more information. BMCC SBDC offers "Social Media Intensive" workshop Feb. 24 at 1 p.m. in Enterprise. Cost $59. Click here for more information. Nominations for the 2017 OR Travel & Tourism Industry Achievement Awards are due by Feb. 28. Click here for more information. 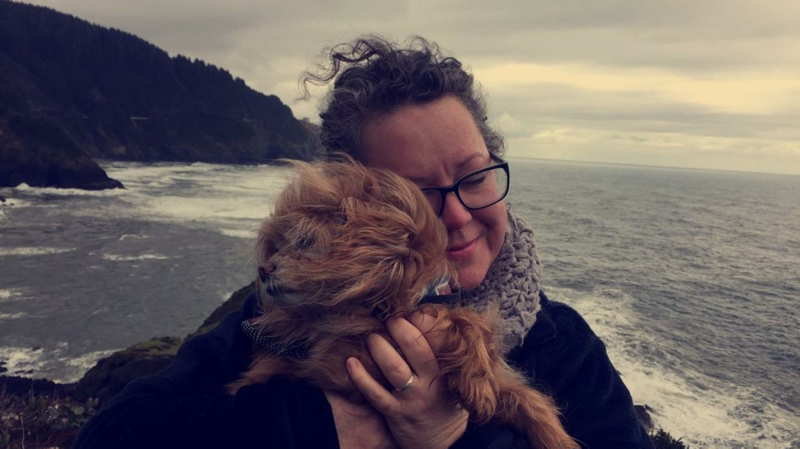 Travel Oregon offers monthly webinars of instruction for their Oregon Tourism Information System, or OTIS, which is a collaborative platform used for sharing and maintaining Oregon’s tourism assets. Remaining 2018 dates are Mar. 7, Apr. 4, Jun. 6, Jul. 11, Aug. 1, Sept. 5, Oct. 3, Nov. 7, and Dec. 5 at 10 a.m. Click here for more information. Save Mar. 16 for the Oregon Bike Tourism Summit. Click here for more information. Employees may be eligible for the Earned Income Tax Credit (EITC or EIC), a benefit for working people with low to moderate income, particularly those with children. Click here for information about the Federal EITC and here for Oregon. Taxes are due Apr. 17. Oregon Governor's Tourism Conference will take place Apr. 29 to May 1 in Bend. Click here for more information. OCF's Creative Heights fund is accepting letters of intent from arts and culture organizations until Feb. 20. Click here for more information. Soroptimist International of Wallowa County welcomes applications for its fellowship for women who seek an advanced degree. Deadline Mar. 1. Pick up an application at the Soroptimist Thrift Shop in Enterprise. Business Oregon offers Export Promotion Grants to eligible small businesses for export training and development activities. Click here for more information.